Product prices and availability are accurate as of 2019-04-09 22:08:31 EDT and are subject to change. Any price and availability information displayed on http://www.amazon.com/ at the time of purchase will apply to the purchase of this product. Having the right tool for the job is essential to get the results expected by professional tradesmen. The Hydro-Handle Professional Plus kit is the right tool for drilling holes in hard material. 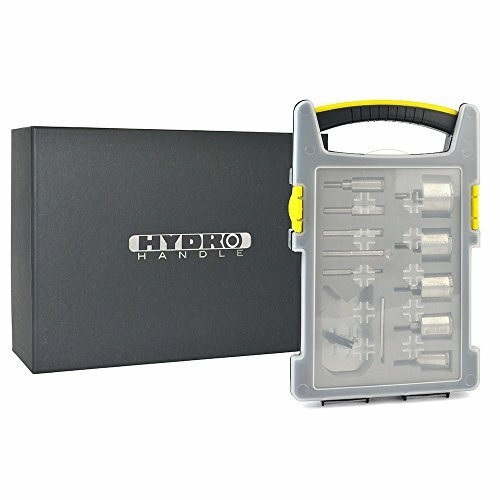 The Hydro-Handle Professional kit comes complete with all Hydro-Handle components which allow full control and stability, Hydro-Handle portable lubrication system and the Hydro-Handle diamond drill bit set with bit guide and custom case. 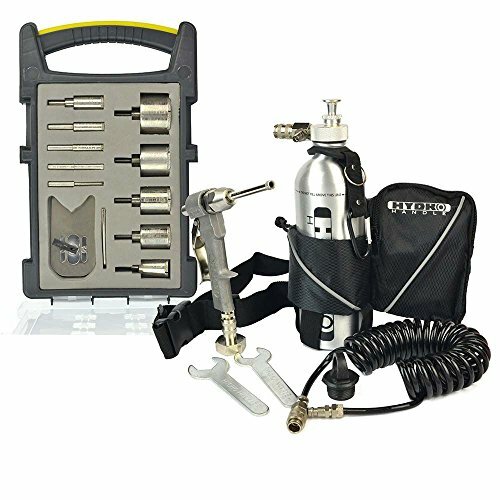 This set includes the Hydro-Handle, 1/2 inch to 5/8"-11 arbor system (for use with standard 5/8"-11 threaded core bits) 8mm compression chuck (for use with HH and common shanked electroplated bits), quick connect garden hose adapter, 8mm diamond pilot bit, wrench assortment and extra seal set, aluminum pressurized water bottle, coiled water line and utility belt. With the Hydro-Handle Professional Plus kit you will be able to turn your cordless drill (or corded, but please use GFCI for shock protection) into a portable center water feed drill. The 8mm pilot can be use in conjunction with any 5/8-11 threaded bit to increase stability and precision. Bit set includes 1 each 6mm/1/4 inch, 8mm/5/16 inch, 10mm/3/8 inch, 12mm/1/2 inch, 18mm/3/4 inch, 25mm/1 inch, 35mm/1-3/8 inch, 40mm/1-1/2 inch, 50mm/2 inch. 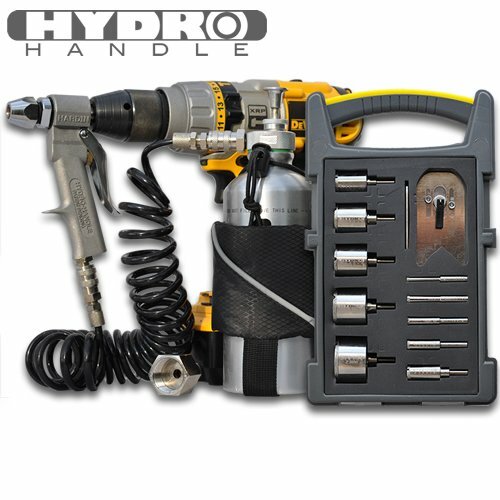 The Hydro-Handle uses an innovative arbor system that allows the user to attach common electroplated drill bits as well as any 5/8-11 threaded tool including core drill bits, backer pads for diamond polishing pads, diamond profile wheels for bull nosing and diamond cup wheels for aggressive grinding. Water is controlled and fed directly through the center of the attachment via the HYDRO HANDLE for optimum cooling. 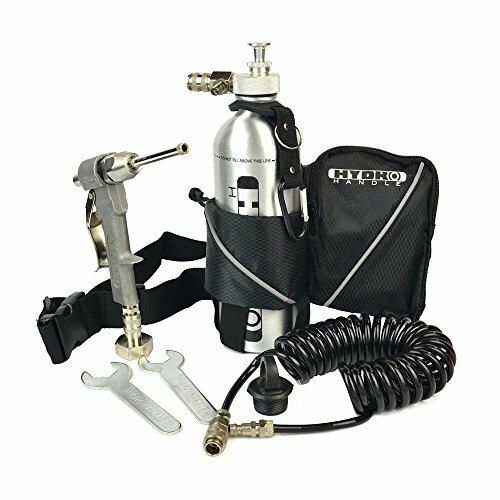 The Hydro-Handle adds an extra point of support close to the attachment enabling you to hold the drill more securely for more leverage, control and convenience. Don't see suitable shipping options? Questions? We're happy to help and are available to talk Monday-Friday 8AM-4PM PST @ 1-877-784-9298.